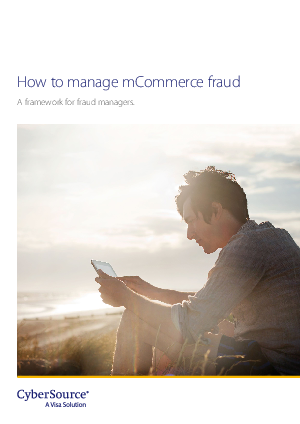 > CyberSource EMEA > How to manage mCommerce fraud. A framework for fraud managers. If merchants want to survive and thrive in today’s digital economy, they must keep up with disruptive business models and evolving sales channels. Because today’s consumers expect a fast, convenient, and secure digital buying experience, a seamless fraud prevention strategy needs to be in place so that merchants’ mobile checkout capabilities can live up to those expectations. Mobile devices are everywhere. 95% of UK millennials now use smartphones; and it’s estimated that across the globe, nearly a billion more people now use mobile phones today than did five years ago. Mobile commerce will continue to grow as smartphones continue to be adopted. For example, forecasts for Europe’s EU 5 (France, Germany, Italy, Spain and the United Kingdom) show mCommerce will account for 43.8% of eCommerce sales by 2020, compared to 32.9% in 2016. As fraud teams determine which orders to accept or reject, fraud managers are key to providing a seamless mobile checkout experience. But they also need to protect their business from fraud – and from the damage it can cause to bottom line, customer experience and brand.